RobotMan, Inc. d.b.a. RobotWorx (“RobotWorx”) repairs, sells, integrates, and maintains both new and used robots to various industrial companies with an emphasis on arc welding robots and robotics. The principals of MelCap Partners assisted RobotWorx in selling the business to the most logical strategic buyer. 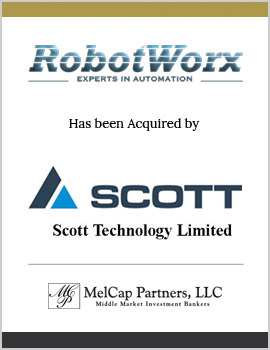 The shareholders of RobotWorx sold the Company to Scott Technology Limited, a strategic buyer located in Dunedin, New Zealand.